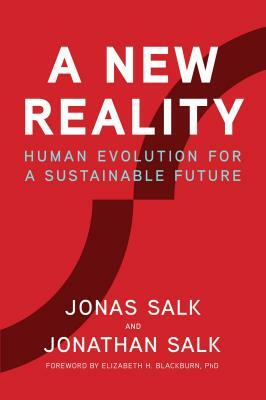 A New Reality: Human Evolution for a Sustainable Future provides a startling, fresh new message of understanding, perspective and hope for today's tense, rapid-fire, kaleidoscopically changing world. Drawn from the writings of visionary scientist Jonas Salk, who developed the polio vaccine, and extended and developed by his son Jonathan, the message of A New Reality explodes from the past, and sheds light on tensions that besiege us, and the currents of discord that are raging as these words are written. More importantly, it indicates a way forward out of our current situation. Written by a world-famous doctor and folk hero, based on population data, rich in visual imagery, elegantly designed, and clearly written, A New Reality is unique in the marketplace. Readable in one or two sittings, it is accessible to the general reader while at the same time being of essential value to policy makers and academics. Its brevity and simplicity of design belie the importance and sophistication of its message. Our country is divided and polarized. Terrorism is a major threat throughout much of the world. Mass migrations are causing national and international tension. Population growth continues to increase, especially in the developing regions of the world. Controversy rages as to the use of fossil fuels versus the development of alternative forms of energy. Disagreement continues about climate change. Opposing currents of opinion collide as to how much we should help other areas in the world and how much to help ourselves. Basic values are in conflict. More than 40 years ago, Jonas Salk understood that we are at a unique moment in the history of the human species. After centuries of increase, population growth has begun to slow and is trending toward equilibrium. This change is accompanied by an equally significant change in human values--a shift from those based on unlimited availability of resources, unremitting growth, excess, independence, competition and short-term thinking to those based on limits, equilibrium, balance, interdependence, cooperation and long-term thinking. This momentous transition is the source of far-reaching tension and conflict. The way through this difficult era is to understand its basis and to focus on new values that will be of the greatest benefit to humankind. There is an urgency, however, and failure to adapt will result in disaster both for humanity and for the planet as a whole. A New Reality delivers a message of both caution and hope. Readers across the social and political spectrum will find it a reasoned and balanced counterpoint to current social and political trends. Its elegant design and long-range perspective will appeal to general readers, policy makers, millennials, baby boomers, teachers, and students, filling a need in the marketplace for a work of positivity and wisdom in otherwise bleak times. Jonas Salk is one of the most famous and revered figures of the twentieth century. He was the developer of the first effective vaccine to prevent polio. Almost overnight, he became internationally famous--a hero to an appreciative public. His legacy survives to this day, and his name and image are instantly recognizable to many. In the last decades of his life, Salk devoted considerable attention to the development of an evolutionary philosophy that would be the basis for solving some of the most basic problems of humankind. He was the author of four books, including World Population and Human Values: A New Reality, written in 1981 with his son Jonathan. A New Reality is an update, revision and redesign of that title. Since his death in 1995, Salk and his legacy continue to be well-known. A recent biography (Jonas Salk: A Life by Charlotte Jacobs, Oxford University Press 2015) was included in the New York Times list of the 100 best books of 2015. Jonas Salk's wish was that his ideas would continue to be disseminated so that, like a vaccine, they might have the most positive effect on the greatest number of people. The book can be seen as his vaccine. Jonathan Salk, is Jonas' son. A highly respected Adult and Child Psychiatrist in Los Angeles, he has lectured and taught about the theory and practice of psychiatry and is Assistant Clinical Professor of Psychiatry at the UCLA David Geffen School of Medicine. An experienced presenter, he has frequently spoken about his father's work and legacy. Jonathan will be available for book tours and interviews across an array of media from radio/ TV to podcasts to lectures. David Dewane is a journalist, architect, entrepreneur, and educator. His background is in ecologically and socially equitable design, having trained under Pliny Fisk III at the Center for Maximum Potential Building Systems in Austin, Texas. David is a Halcyon Fellow and has been honored as an Emerging Leader by the Design Futures Council and certified as an EVOKE Agent by the World Bank Institute.